…Where does a kannel get its covers? From the jawbone of a salmon. Where does a kannel get its winded strings? The little kannel is very suitable for making chamberly music at home, accompanying someone's singing, for ensemble playing or the musical background when talking to others and working with children. The popularity of little kannel grows among teachers as it can be easily learned and taught. Music therapists suggest the soothing sound of the little kannel for lowering stress and relaxation. The longest string (the lowest sound) is taken for the basis of tuning the little kannel. When the 6-stringed little kannel's first string is G, then the tuning is G, A, H, C, D, E. When the first string is D, then the tuning is D, E, Fis, G, A, H etc. 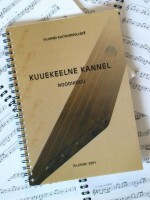 The tuning of the little kannel can be changed upward and downward in a range of about one tone. According to that a G-instrument can be played in the major key of F and A. Too loose strings do not sound any more and too tight strings can be broken when playing. It is easy to tune a little kannel into minor as well. In case of a 6-stringed G instrument we get G-minor tuning the 3rd and the 6th string lower half a tone. On the little kannel it is possible to form the I, IV and V level chords, that are mostly used when accompanying songs. 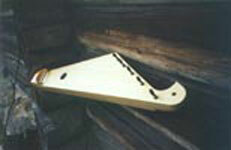 This instrument is mostly known in Finnish and Karelian areas. The standard G instrument is about 50 cm long, 11cm wide at the widest and 7 cm at the narrowest part. It is suitable for playing in F-A tonalities. The standard D instrument is about 70 cm long and 12 cm wide at the widest and 7,5 cm at the narrowest part. It is suitable for playing in C-E tonalities. 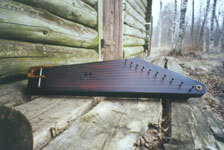 This instrument is mostly spread among Baltic nations and in North-West Russian region. The standard instrument G is about 50 cm long, 13 cm wide at the widest part and 8 cm wide at the narrowest part. It is suitable for playing in F-A tonalities. Standard instrument D is about 70 cm long and 13 cm wide at the widest part and 8 cm wide at the narrowest part. It is suitable for playing in C-E tonalities. A textbook which includes 60 songs together with tunes in notes is freely available with the instrument. 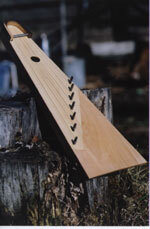 As for the playing technique and tuning this instrument is similar to the 6-stringed kannel, but it has extra the seventh base string (dominant), that suits well with the sound of chords by this type of kannel. It also widens the possibilities to play. The Tuning of G instrument is D, G, A, H, C, D, E. It is a little wider than the 6-stringed kannel. The type of kannel is practically similar to the 5-7 stringed instument. The differnce is in the number of strings and the width of instrument. The playing technique of the 10-12 stringed instrument does not differ from the 5-7 stringed kannel's. There are more strings, the sound range is wider and the sound is more powerful thanks to bigger sound board. Naturally it is harder to learn to play this type of instrument, but it also gives more possibilites to the player. The standard G instrument is 55 cm long, 19 cm wide at the widest and 12 cm wide at the narrowest part. The tuning is D, E, Fis, G, A, H, C, D, E, Fis. The standard D instrument is 75 cm long, 20 cm wide at the widest and 12 cm wide at the narrowest part. The tuning is A, H, Cis, D, E, Fis, G, A, H, Cis. 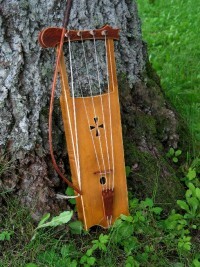 This instrument is spread in Setomaa (South-East Estonia) and North-West Russian regions. 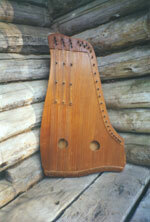 It is similar to little kannels by tuning, but it is made of one wood block and has the extention of the sound board, which is called laba in Estonian. It is possible to order 5-12 stringed instruments with the usual little kannel tonality (G, D). We make seto kannels for special orders in other tonalities as well. Different types of little kannels can be ordered in the colour tones of natural wood or stained in suitable colour for you. All the sides and the bottom of the little kannel are lacquered, but the sound board is stained or oiled. When desired the metal winding pins (virbel - Est.) are substituted by wooden ones. NB! With all the kannels you get an extra set of strings and a tuning key. 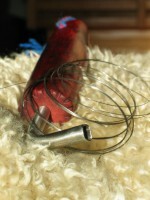 This instrument is widely used when playing at home or at folk music groups. This type of kannel allows to play the melody and to accompany it with chords at the same time. Melody is played with the right hand and the left one is used for chords or both hands play melody. Its construction is similar to the chromatic kannel, but the strings are parallel to the sound board. It is 85 cm long and 45 cm wide. This kannel is developed from later diatonic folk kannel types. The chromatic sound order allows to play music from folk to Bach on this instrument. The sound diapason is C-A3. To simplify the playing the strings have not been put straight and across each other, so that under the right hand there are the whole tones and under the left hand are all the half tones (it is similar to the piano principle of black and white keys). The carcass has been made of birch or ash, the sides are covered with special cover material (spoon Est.) or stained to mahogany tone. 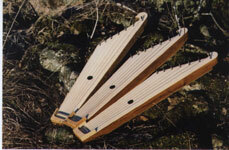 The upper sound board is made of fir (sound material) and the lower board also of fir (sound material) or maple. The frame and the bottom are lacquered. The instrument is 95 cm long and 55 cm wide. The set includes 3 supporting legs (supporting sticks) and a tuning key. 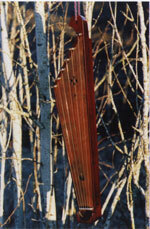 Bowed harp belongs to the group of bow instruments. It is palyed either with a bow or in the picking technique. 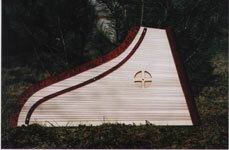 As for the playing technique and construction this bowed harp is similar to the violin. The instrument is about 53 cm long and 15 cm wide. In the instrument set there is also a horse hair bow. For the strings I use hair from horse tail or artificially made nylon strings. Strings made of nylon stay better in tune and adjust well to the changes of temperature. It is also possible to order a suitable box to the instrument. How is it played? Check Picture Gallery. The melody is played on the first two strings and the lower ones are bourdon strings. When playing, the instrument is leaned atilt on one's knees, the bow (peele Est.) is held with the left hand and the sound is made with the back of the same hand fingers pressing against the first and the second string. The other strings are pulled with open hand during playing. There are also T-shirts with pictures of Kannel-wizard. Sizes S, M, L, XL, XXL. The shirt costs 7 EUR. Look at the picture of the T-shirt here. Playing instruction and 60 tunes for 6 -7 strings kannel.